Immediately following the Eucharist, our Mission Team Leader, Erna Cunningham, Pediatrician and Pediatric Health Leader, Dr. Patricia Rowe-King, and I went to Channel 5 Belize Television Station, where we were interviewed by William Neal and Marleni Cuellar. The 30-minutes interview was part of a morning show, called, “Open Your Eyes.” Later in the evening, the same news media came to the Health Clinics at St. Mary’s Anglican School, where Erna, Dr. Pat, and Dr. Arlene Richards, the Adult Health Co-Leader, were interviewed. Father Tony sharing in discussion during Educators’ Seminar. “Scripture and its role in our Lives,” this seminar was shared with approximately twelve educators and administrators of the Anglican Schools in the Diocese. 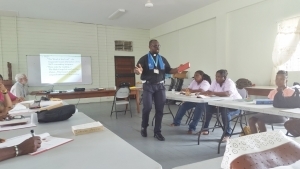 The 4-hour seminar focused on three areas: The role of Scripture in Worship, the Teaching of Scripture in the Book of Common Prayer, and the Effectiveness of the Role of Scripture in the Daily Life of the Christian. 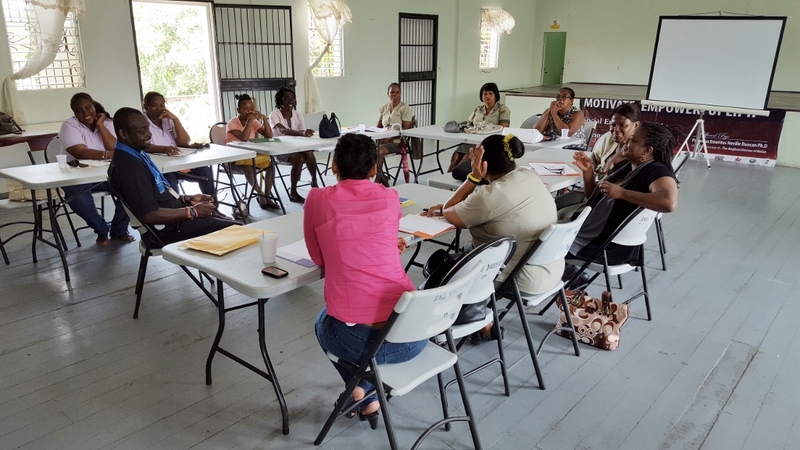 There was great discussion and interaction between educators and me, and from all reports, it was well received, and was said to be meaningful, and educational. One of our missionaries, Daniel Ross, accompanied me and operated the slide presentation. Following the seminar, Sehon, Father Richards’ grandson, drove Dan and me to St. Mary’s School where the Health Clinics were taking place. In addition to the clinics, workshops on First Aid and CPR were held by some of the nurses on the health team, under the leadership of Bibi Achaibar and Carol Bhim. These workshops were attended by over 50 teachers. 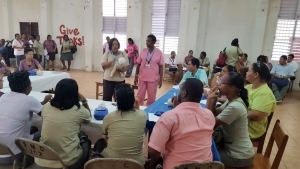 Sharlene Barrow and Valarie Prescott lead a workshop on First Aid/CPR. I also met, for over an hour, with a young mother who lost her 10-year son to death earlier this year. As expected, it is a very devastating time for her and her family. I prayed with her, comforted and reassured her. Then it was on to see the construction team and how they were developing with the painting of the building and refurbishing the restrooms at the Anglican School at Queen’s Square. 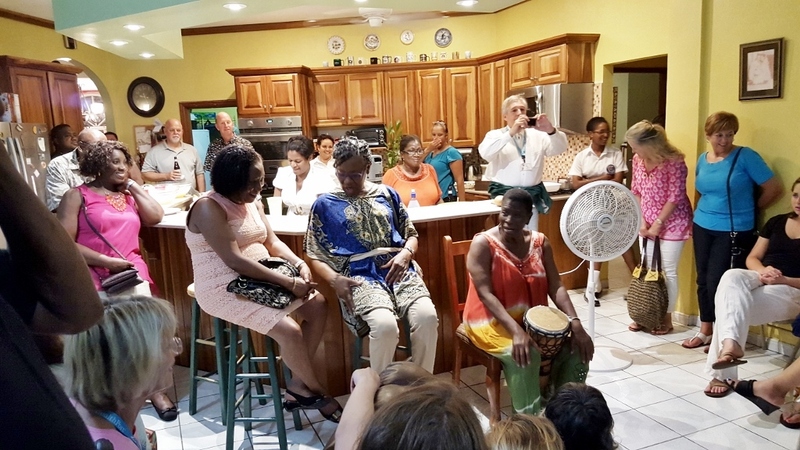 Myrna Manzanares, a Belizean international story-teller, folk-lore singer, playing on drums and serenading the team at the home of the Youngs. 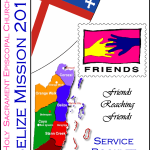 respectively of, the current Governor General of Belize, Their Excellencies Sir. Colville Young and Lady (Norma) Young. 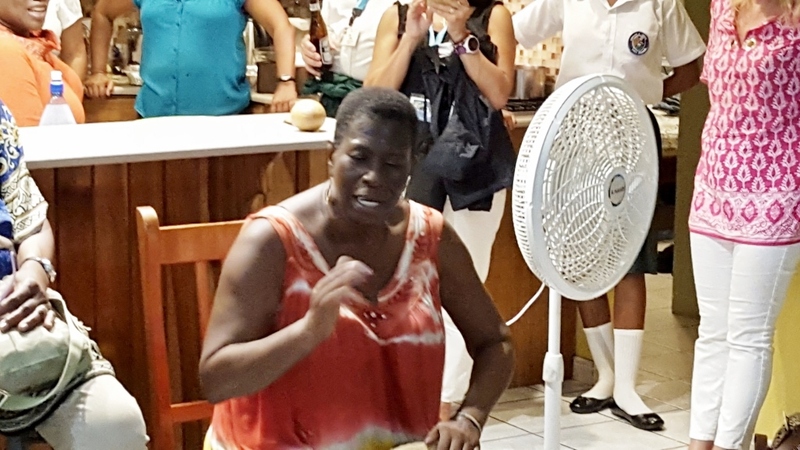 We spent a wonderful time at their home, enjoying delicious Belizean cuisine, wonderful fellowship, and beautiful entertainment performed by Ms. Myrna Manzanares, a Belizean international story-teller, folk-lore singer, and friend of the Youngs. 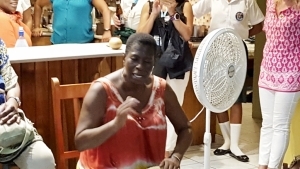 Ms. Manzanares performed a number of folk songs, giving us the history of them and engaging us in the singing. We returned to the hotel, where we retired for the night. 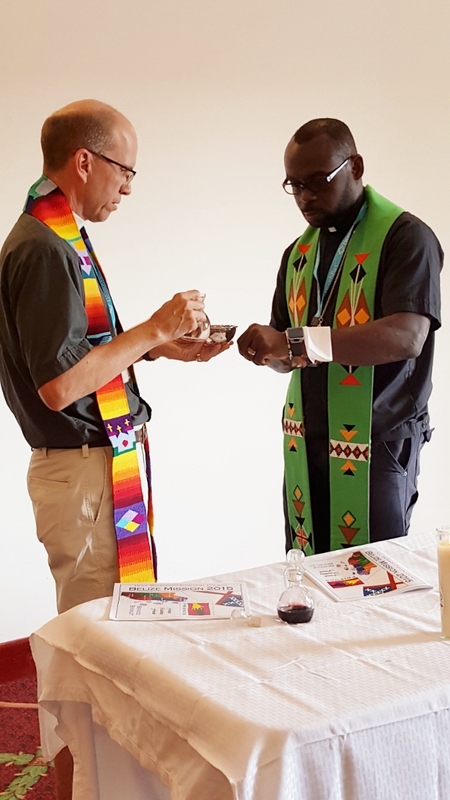 Fathers Jon Robbins and Tony Holder assisting each other during a morning Eucharist. Social Evening at the home of Lynn and Althea Young.